Inside the House of Representatives, there is an internal communications system designed specifically for members and their staffs. It's a legacy product from when members used to send each other physical interoffice mail, addressed "Dear Colleague." The "e-Dear Colleague" system has existed since 2008 as an intranet database of messages that can be searched by topic, and as a kind of listserv on official doings for the 435 representatives' offices. With so many people on the opt-in subscription service, the volume of email is high, which is why when there's an important intelligence briefing for members of Congress, staffers are formally notified directly by their party leaders in the House. 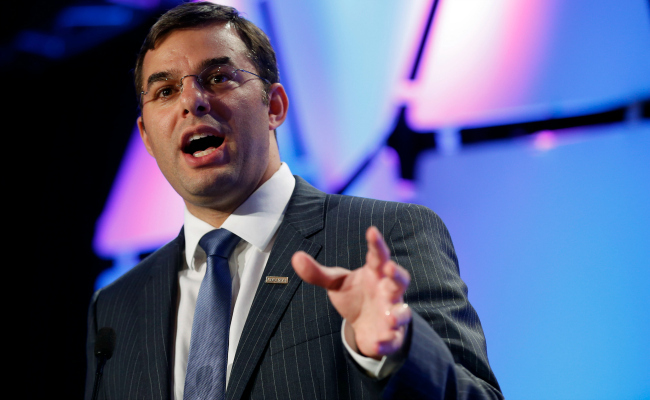 Except in August, according to Rep. Justin Amash, when something extraordinary happened. An important national-security document the libertarian Michigan Republican and some of his colleagues on the House Permanent Select Committee on Intelligence had been trying to see for some time was made available to all members on less than 24 hours' notice by the Intelligence Committee chair, with a viewing scheduled for when they were supposed to be voting, and on the very day Congress was set to begin its five-week summer recess. And the email went out through the "e-Dear Colleague" system, where it was buried. What you hear from the intelligence committees, from the chairmen of the intelligence committees, is that members can come to classified briefings and they can ask whatever questions they want. But if you've actually been to one of these classified briefings -- which none of you have, but I have -- what you discover is that it's just a game of 20 questions. You ask a question and if you don't ask it exactly the right way you don't get the right answer. So if you use the wrong pronoun, or if you talk about one agency but actually another agency is doing it, they won't tell you. They'll just tell you, no that's not happening. They don't correct you and say here's what is happening. So you actually have to go from meeting to meeting, to hearing to hearing, asking asking questions -- sometimes ridiculous questions -- just to get an answer. So this idea that you can just ask, just come into a classified briefing and ask questions and get answers is ridiculous. You're not going to ask questions about things you don't know about. The point of the Intelligence Committee is to provide oversight to Congress and every single member of Congress needs information. Each person in Congress represents about 700,000 people. It's not acceptable to say, 'Well, the Intelligence Committees get the information, we don't need to share with the rest of Congress.' The Intelligence Committee is not one of the branches of government, but that's how it's being treated over and over again. And to show you how silly this whole thing gets, I had a colleague, one of my -- I won't say his name here, but he went to a number of classified briefings. And he asked a question and he never got a satisfactory answer. So he would just revise the question from briefing to briefing. By the time he got to to the third or fourth briefing he asked it in just the right way. He had figured out how to ask it in exactly the right way to get the answer he needed and of course, then they said, "Oh, you caught us. Yeah, we do do that." Then we said, "Can you provide us with some more information?" and they said, "We'll check, we'll see if we can provide you with more information. We'll see if we can provide you with a document" about this thing that he discovered. And so we left that briefing and we said, "OK, we're going to see something very interesting here." Then the way we were notified about the availability of this document was through a totally irregular channel. So they said, OK, we'll make this document available to you but we're not really going to give notice to anyone. They sent it through the "Dear Colleague" system. This is a system that, it's almost like a spam folder, frankly. Not everyone in Congress is signed up to it. And basically it's a system where you send letters to your colleagues -- will you cosponsor my bill, will you sign my letter, that kind of thing. Normally if you're getting information about an upcoming briefing or an upcoming document that's going to be available to members of Congress, you would get an email. An email, a normal email would come to you, to all members of Congress saying, "Hey there's a document that's going to be available, come stop by." But no, we got it through the "Dear Colleague" system. And the only reasons we noticed is because one of my staffers is silly enough to have this spam folder and look through it and she helped find it and she alerted me, "Hey we've got this document that's going to be available tomorrow, and it's going to be available between 9 a.m. and noon." And it's available between 9 a.m. and noon on the day when members of Congress are leaving to go back to their districts. So I went back to my colleagues and said, "Hey, did you hear about this briefing with this document?" and they said "No, what are you talking about?" I said there is this notice, we found it, that this document's going to be made available. They said, "We haven't heard of it." I said, 'OK, well come down to the briefing room.' They said "OK, if you say so." We grab a few more people. The only people who showed up at that briefing were the people I talked to. Nobody else knew that that was going on. Not a single person outside of the people I talked to knew that was going on. And we had to sign a disclosure ... an anti-disclosure agreement saying we wouldn't talk to any of our colleagues about what we saw. So we can go to this briefing, we can see this document -- which I can't tell you about -- and we have to sign a document saying, we had to sign a non-disclosure agreement saying, we're not going to talk to any of our colleagues about what we see here. And that's it. You've got that three-hour window, done. After that, you're not going to hear about it again. And so you can see why the intelligence community when they ridiculously send out a press release -- today* -- saying, "Oh we provided these briefings to members, if they didn't come by they're just too lazy. If they didn't know about these programs it's because they're just not competent." That's basically the gist of what they're saying when they send out these press releases. It's totally ridiculous, and it's outrageous. In response to Members’ questions during briefings on the NSA programs, the House Permanent Select Committee on Intelligence (HPSCI) is pleased to make available to Members a classified letter from the Office of the Director of National Intelligence. Specifically, the classified document will be available to Members-only for review with a HPSCI staff member from 9:00 am to noon, tomorrow, August 2nd. If you are interested in reading the letter, please have your staff contact [aide's name] at [her phone extension] or [her email] to schedule a time to do so. Susan Phalen, spokeswoman for the Intelligence Committee, explained the notice as one intended to inform Congress rapidly about a matter of interest, rather than one seeking to hide any information from them. "As we have said before, the House Intelligence Committee makes it a top priority to inform Members about the intelligence issues on which Members must vote. This process is always conducted consistent with the Committee’s legal obligation to carefully protect the sensitive intelligence sources and methods that our intelligence agencies use to keep the American people safe," she said. "A classified briefing hosted by the House Intelligence Committee on August 1, 2013 raised a new issue. Chairman Rogers wanted to make a document relevant to that brief, and briefers from the intelligence community, available to brief and answer questions from Members prior to their heading home for the August district work period. As such, the Committee made that document available for Members’ review the next day, August 2. It is unfortunate that many Members do not take advantage of these opportunities." A staffer in Amash's office called the document that the representative was briefed on an important document other members of Congress would want to know about. The House Intelligence Committee makes it a top priority to inform Members about the intelligence issues on which Members must vote. This process is always conducted consistent with the Committee’s legal obligation to carefully protect the sensitive intelligence sources and methods that our intelligence agencies use to keep the American people safe. Prior to voting on the PATRIOT Act reauthorization and the FISA Amendments Act reauthorization, Chairman Rogers hosted classified briefings to which all Members were invited to have their questions about these authorities answered. It is unfortunate that some of the Members now attacking the Committee chose not to avail themselves of the opportunity back when these programs were not discussed so prominently in the news media. This post has been updated to add a statement from Phalen and additional details about the e-Dear Colleague system from the Office of the Chief Administrative Officer of the U.S. House of Representatives.